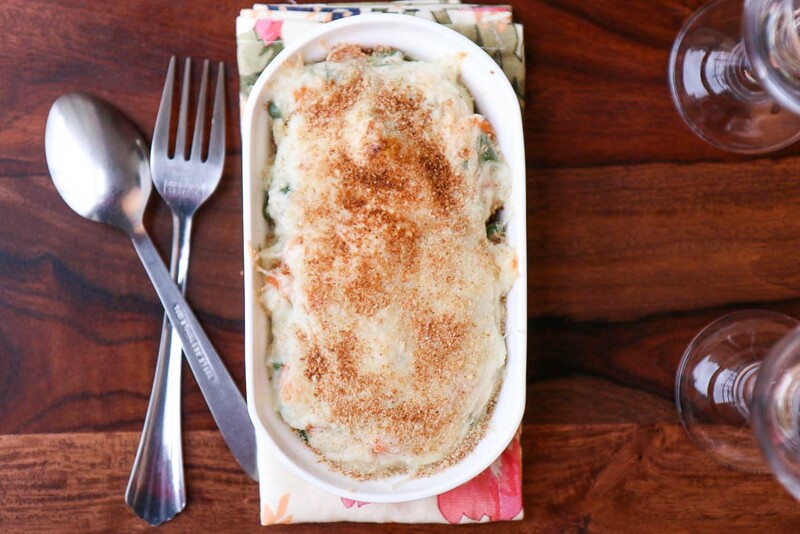 The Vegetable Au Gratin recipe is a classic french dish where the vegetables are baked along with a creamy white sauce called the béchamel sauce. This is one of the favorite dinners at home and I love it especially because it is quick to make and super healthy too. I like to make my bechamel sauce with different types of flours making it healthy and guilt free.You can bake with a combination of vegetable and play around with the recipe by adding more flavours. Serve the Au Gratin along with toasted Garlic Bread bread and Tabasco Sauce for a cozy Lunch. To begin making the Vegetable Au Gratin, we will first preheat oven to 200 C.
Stir in the steamed vegetables to the white sauce. Taste and adjust seasoning to suit your taste. Transfer the vegetable gratin to a greased baking dish and sprinkle the cheese evenly on the top. Bake the vegetable au gratin in the oven about 20 minutes or until the cheese has melted and has turned golden brown. Remove the Vegetable Au Gratin from oven, let stand for 10 minutes before serving.Sprinkle Red Chilli Flakes or Tabasco Sauce on top.